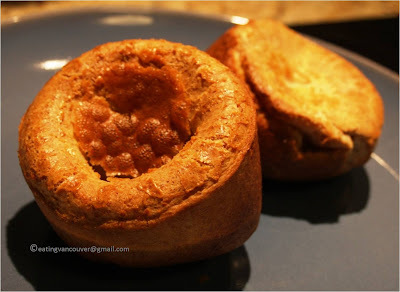 Grease a 6-cup popover pan with the 1 t of butter. I used a silicon brush. Bring a large pot of salted water to a boil. Use a good 1-2 T of salt. Some people have said your pasta water should be as salty as the sea. Start the sauce just as you put the pasta in the water. 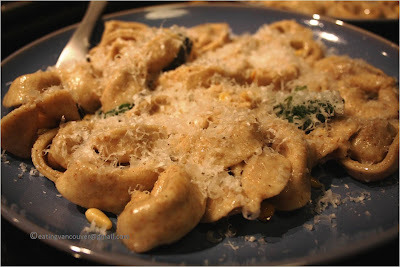 The pasta, fresh, in this form, tortellini should could for 10-11 minutes. Seriously. Lived it learned it. 8 minutes for perhaps fresh spaghetti but not folded thick pastas like tortellini. In a non stick pan, toast the pinenuts until golden. It won't take long and careful not to burn. Set aside.Melt the butter with the olive oil. The oil is to avoid scorching so you could leave it out. When the butter is hot and melted toss in the cleaned and dried sage leaves. Let brown slightly but not burn. Toss the pinenuts back in. Drain the pasta with a slotted spoon and add directly to the butter. You don't need to be vigorous about the draining since some of the pasta water is welcome to the sauce. Toss lightly. Serve with freshly grated parmesan and freshly ground black pepper. Salt should already come from the salted water. Had a Llanos de Almendro red 2003 from Dominio de Atauta.